AG and Sons: Here comes you, all dressed to shine! Here comes you, all dressed to shine! Now while the golden rule is to not upstage the bride, you can still look your best with a little wow factor added with jewellery from AG & Sons. Necklaces can make a bold statement while adding a touch of class and sophistication to your outfit. If you are wearing something simple and feel your outfit is lacking some oomph! Add a pop of colour with a gemstone necklace. Guaranteed to make you look and feel fabulous! What’s a little cluster anyway? Cluster necklaces are known for being beautiful, versatile and stylish. For something a little understated and sleek, choose the cluster necklace. Earrings are one way to draw attention to your facial features and gives you an overall polished outlook. For enduring beauty and understated elegance, diamond studs earrings are the ultimate choice. Suitable for everyday wear and glamorous occasions alike. Ultra feminine and effortlessly stylish, Halo diamond stud earrings are all you need to give your look an instant update. 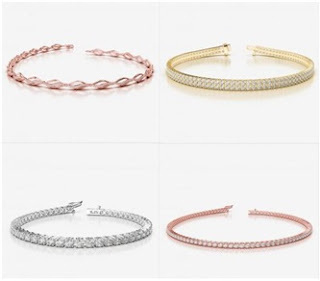 Celebrate the elegance of simplicity with a diamond bracelet. Suitable for every style and taste, diamond bracelets are the perfect wrist-wear to effortlessly step up the luxurious look. Give yourself a little wedding treat and create a memory that lasts a lifetime.